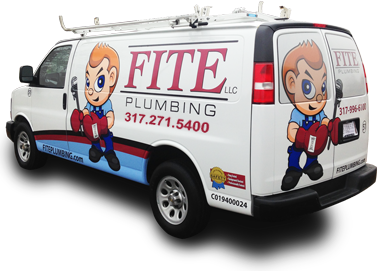 Located in Plainfield, Indiana, Fite Plumbing is a leading family-owned plumbing company serving Indianapolis, Plainfield, Avon, Mooresville, Greenwood, and the surrounding Central Indiana areas. We welcome any project — large or small — and provide installations, maintenance, repair and more to residential, commercial and industrial facilities. Fite Plumbing is available for both scheduled and emergency services. Our staff is skilled, trained and highly qualified to provide you with individualized attention for your plumbing issue, request or concern. For anything from small repairs to full plumbing design, we are prepared to serve your home or business with outstanding professionalism and competence. At Fite Plumbing, we welcome any questions, comments or concerns you may have. We strive to meet all your plumbing needs in a timely and efficient manner. Our friendly, qualified team members are happy to provide the necessary information to help you with your request, issue or concern. We want to provide you with the best service and customer care available, so please contact us anytime you need information or assistance. You can reach Fite Plumbing by phone or email 24 hours a day, 7 days a week, 365 days a year. Please call 317-271-5400 or email us at service@fitellc.com. Or you may submit your question or request via the form below, and our professional team will gladly respond quickly to your needs regarding services or future projects. We look forward to hearing from you soon and providing you with the highest quality service and excellent customer care!